You don’t have to climb an 8c to look good in it. When it comes to a climbing pant, there are a few criteria for me which has to make it pass to use it outdoors: comfort, flexibility, durability, climate, design and colours. The Fritzi pant comes with a broad jersey band that holds the pants comfortably under the harness. There’s no twitching or buttons that becomes uncomfortable, after hours of sitting in your harness. I also didn’t have to worry about the jersey loosening up after a few washes. This band kept the pants on. The pant is tight at the top, baggy at the bottom. The material made from 97% certified biological cotton feels very durable, yet soft. 3% Elasthan ensures flexibility of the garment The cuff at the ankles retains the heat on colder days and at the same time, it doesn’t get in the way when you’re looking for your footholds. I was sceptical to a static cuff comparing to the elastic ones in other brands. But within time, I found a few uses for this and along disappeared my fear. On warmer days, pull the cuff up to your calf, it will stay there without cutting in and voila, the pant becomes a 3/4. If the pant is too long, tuck in the cuffs to shorten the length. This wonder cuff, does quite a bit. Wind was never a problem when I had the pants on. It’s not wind proof, but it does ward off most of the blasty winds. In no way will the pant hind you in aerobic movements that ranges from a shoulder length heel hook to a split. It was me who had more problems getting into such a flexible position. It’s so comfortable, I left it on even after climbing. This pant came along with me while climbing in Tenerife and had to withstand cactus thorns and bushes during the access. I was glad I had long pants on, and one that doesn’t tear easily. There’s no pockets behind, which is what I found to be perfect for a girl.A small loop at the side of the pant for the toothbrush comes in handy for the boulderers amongst you. You can find out the right size you will need on their website (in german). I usually wear a pant size 36 and the XS came in perfect. Their palette of colours are fresh and striking, new models comes out twice a year. The pant retains it’s colours and shape even after multiple washes. It didn’t shrink even after once it landed unintentionally in the drier. The Fritzi womans pant has everything which you would be looking for in a comfortable climbing pant. Cool colours, cool fit and cool design. 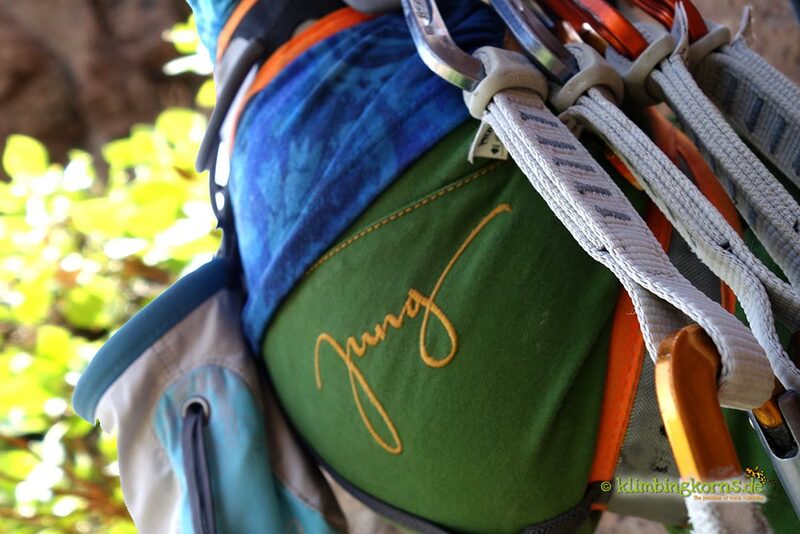 Priced at 104,95 EUR this is one of the pricier brands for a climbing pant. But knowing that this pant works not only to look good, but is functional and comfortable, I went for seconds. *Disclosure: I was not financially compensated for this post. I received a sample for review purposes. The opinions are completely my own based on my experience.